What is the real issue behind the current crisis in the Eurozone? Trust. Which is why the situation is so unpredictable and rapidly changing. 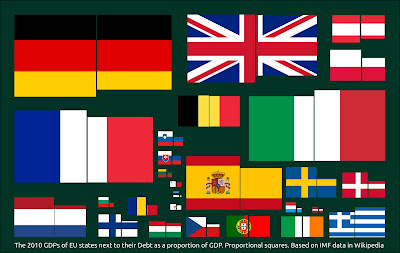 On average, an EU country has a debt burden that is 80% of its annual GDP (see chart), with all the larger economies being the major culprits. What distinguishes say Germany from Italy? It is the trust of a country's lenders in the country's ability to pay back the debt if challenged. As small businesses we know that the trust you have gained from your clients is a hard-won achievement. We also know that that trust can be easily lost. Unfortunately, there is a multiplicity of different trusts at play in the current European crisis. For example, because Italy needs such a large bailout, questions begin to arise whether the other Eurozone countries can afford to cover it. France is now working desperately to ensure that it maintains its triple A credit rating. Then there is the trust by a nation's people in their government's decisions. Current economic measures cause dramatic changes in existing social contracts and real job insecurity. If a tipping point is reached, trust in a government is lost and it becomes untenable - see the escalating protests at home and abroad. Trust is an emotional issue. Logical arguments take a second place. Which path the crisis will take - resolution by sudden inspired leadership, total collapse due to national popular revolts or a mess in-between - is unpredictable. The one certainty is: These trust issues will have a major impact on us all. Prepare for the worst and hope that we will be pleasantly surprised.